Dazzling Paws Jewelry for people who love dogs. Welcome to Dazzling Paws Jewelry! In 1999, Trent and Myra Westphal were making tons of tennis ball rope dog toys by hand to be used for Border Collie Rescue fundraising. In an e-mail, one of the members of the rescue group nicknamed their little sweatshop operation "Doggy Toyland". The name stuck and it grew into a retail business. In 2003, they opened an online retail store and became vendors at various pet expos, horse fairs, agility trials, fly ball tournaments and other pet related events. Their vision was to offer only pet-friendly and environment-friendly toys. They loved meeting and connecting with other animal lovers and the immediate in-person feedback! They stay true to their roots and you will still find them at shows and events covering the entire USA. As a vendor at a dog show, Myra was wearing a paw print ring. An admiring customer asked about the ring and wanted to buy it. That got Myra thinking... her background was in jewelry and design. Myra started working at a jewelry store at age 16 and by 18 she was designing jewelry for the prestigious wedding market. Myra's pieces have been featured in Modern Bride and Bridal Guide, some are still being manufactured today! Myra began to research unique dog themed jewelry for people and she could not find the selection or quality she knew there was a demand for. So in 2004, Myra drew on her experience and love of dogs to launch her own Sterling Silver Agility jewelry line. The first piece she chose to create was the A-Frame with a tunnel under it. It was so popular in the agility community that shortly after, a teeter totter followed then weave poles and the agility jewelry collection grew. The Dazzling Paws Jewelry agility line was and is very unique; all the charms are 3-dementional and show incredible detail. One customer said that it brought back memories of her beautiful childhood dollhouse and miniature collection of accessories for it. That is quite a compliment to smile about and be proud of for being successful in the vision of realism and detail! To make a long story short(er), Myra's agility jewelry caught fire which sparked design for other dog sports, more lines, themes and accessories in dog jewelry essentials that speak to the heart of a person's love for their dog! We continue to grow each year; adding new and exciting jewelry pieces and new and wonderful customers. Myra is passionate about creating new jewelry designs for animal loving people with her work being inspired by her family, friends, people she meets and life experiences. By 2010 jewelry had become a major part of the business. The name Doggy Toyland did not quite fit the product line or evolving business identity. Myra has always been inspired by customer feedback so she took this "problem" to the people. A contest to "Name That Brand" was established and the response was overwhelming. Two contestants submitted the same name and were both chosen as winners: Ruth Wenzel and Judi Gullickson. That is how the name Dazzling Paws Jewelry came about. It had really become apparent that the distinctive jewelry for people who love dogs was what made this company special and successful. As of July 1, 2012 Dazzling Paws Jewelry became the official name of the business. Customer demand for this unique pet jewelry line facilitated the need for a change in direction and focus. As owners of Dazzling Paws Jewelry, Trent and Myra demand excellence from themselves and have a passion for working one-on-one with customers. As the business has grown, they also expect the same high standards of excellence from their employees and partners who do business with them and on their behalf. They are careful to select and approve a limited number of wholesalers and retailers to carry Dazzling Paws Jewelry products and lines. This purposeful plan for growth has steadily helped to expand the Dazzling Paws Jewelry product reach and network into more shows and areas. Dazzling Paws Jewelry still enjoys the luxuries of being a small business; being able to thrive on networking, making real connections, offering true attention to detail and being able to provide the personal experiences you just cannot receive from big box retail stores. Dazzling Paws Jewelry caters to pet owners that love their dog/s and understand the extraordinary interaction of a human-canine bond relationship. Dazzling Paws Jewelry specializes in the dog sport enthusiast that is addicted to dog training and showing in activities like: Agility Trials, Flyball, Rally and Traditional Obedience, Conformation, Canine Freestyle and other sporting venues. The Dazzling Paws Jewelry product line reflects the diversity of our customers. We are always open for new ideas to strengthen our product line. Dazzling Paws Jewelry has even added some cat jewelry pieces with purr-sonality due to popular demand. Please feel free to contact Myra about pet jewelry pieces you feel should be designed. 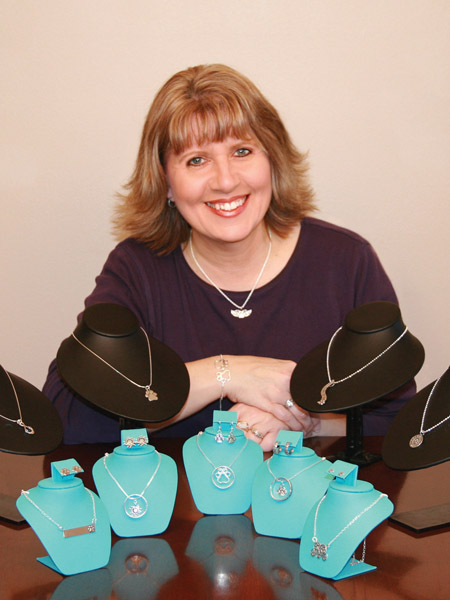 Dazzling Paws Jewelry operates our business by one philosophy: Do whatever it takes! It is our pleasure to do whatever it takes to make you the customer happy. Today we have an entire team of people that work for us in Graphics, CAD, IT, website management, copy writing, sales, accounting, marketing associates, and product specialists that ALL work to make your experience pleasant and successful! - Is 100% handmade in the USA. - Stocks up to 98% of our products, ready to ship. - 60-70% of the staff work from their home which reduces the fuel carbon imprint on the planet. - Is proud to Pawtner with responsible dog related charities to give back to the dog community. We try whenever possible to embrace green policies and habits for the good of our environment!